John S. Ball, III brings more than 30 years of experience in the asphalt contracting business to his clients. He has held various positions during his career including rolling, paving, project management, District Manager and Director of Training. He is a member of National Asphalt Pavement Association, Hawaii Asphalt Paving Association and a past president of New Hampshire Good Roads Association, an organization for the promotion of good highway roads in the state of New Hampshire. John is currently the owner of Top Quality Paving and Training (T.Q.P.) which specializes in best practice and getting back to the basics for the asphalt industry. T.Q.P. is a training and consulting firm utilizing video and hands-on presentations detailing success in developing and implementing employee training programs. 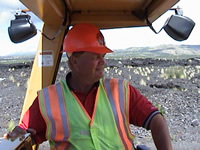 John's specialty is achieving compaction and rideability on QC/QA Projects. John is a lecturer for numerous asphalt paving associations and manufacturers in the asphalt industry. He has had international experience working in Saudi Arabia, England and Ireland. John has hosted numerous training seminars for national publications. His articles appear regularly in The Asphalt Pro Magazine. John has created a complete training library: employee guidelines, employee job descriptions, pocket conversion tables and over 100 training videos. John uses video critiques of paving operations as a tool to improve quality. He is the author of numerous articles on top quality paving techniques. Visit Asphalt Contractor Magazine Online!